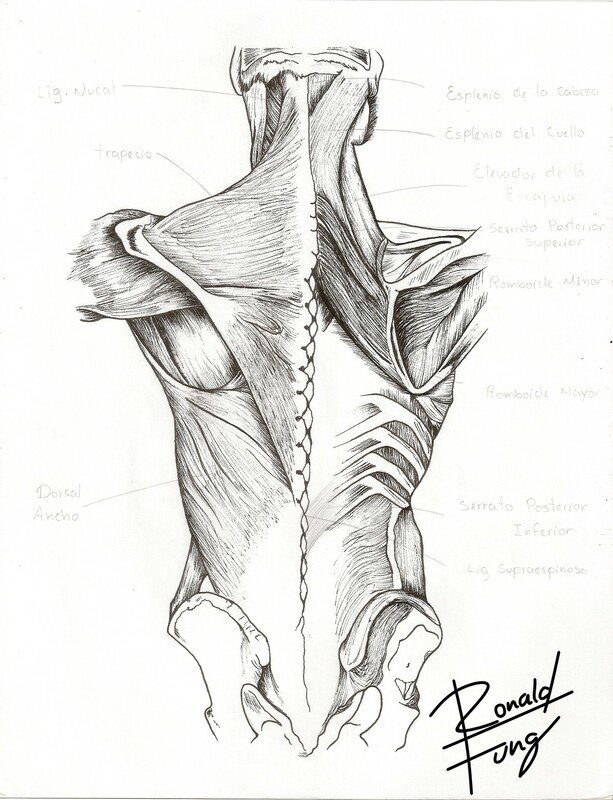 Hello guys, today i bring you something that i did a long time ago, i used to study the back muscles, it helped me a lot, i hope you like it! a) SUPERFICIAL MUSCLES: associated with shoulder movements. b) THE INTERMEDIATE MUSCLES: associated with the movements of the rib cage. c) INTRINSIC OR DEEP MUSCLES: associated with movements of the spine. The deep muscles of the back extend from the sacrum to the base of the skull. They are associated with movements of the spine, and control of posture. The intrinsic muscles of the back are covered by the deep fascia, which plays a key role in your organization. Here comes the transversal or transverse spine thorn that lies below the semispinalis muscle. And that in the lower back presents a greater developed. It is a muscle located below the trapezius and sternocleidomastoid, is a wide and thin muscle, which occupies the entire height of the nape and the top of the back. It is formed by two muscles, splenius capitis and splenius cervicis which are associated with the movement of the head and neck, for example in extension movements. This is a thin rectangular muscle that lies deep in the rhomboid muscles in the upper back. The lower posterior serratus is broad and strong and lies below the latissimus dorsi. The iliocostal muscle is located laterally within the spinal erector and is associated with the ribs. Acts unilaterally to laterally flex the spine. Acts bilaterally to extend the spine and head. This is located medially within the spinal erector. It is the smallest of the three muscle columns. It is a wide, flat and triangular muscle. The muscles on each side have a trapezoidal shape. This is the most superficial of all the muscles of the back. The upper fibers of the trapezius elevate the scapula during abduction of the arm. The middle fibers retract the scapula and the inferior fibers pull the lower scapula. This originates from the lower part of the back, in which it covers a wide area. Extend and rotate the upper limb medially. It is a small muscle in the form of a strap. It starts in the neck, and descends to insert itself into the scapula. It is responsible for raising the scapula. There are two rhomboid muscles, the major and the minor, and both participate in retracting and rotating the scapula. Congratulations! This post has been upvoted from the communal account, @minnowsupport, by ronaldfung from the Minnow Support Project. It's a witness project run by aggroed, ausbitbank, teamsteem, theprophet0, someguy123, neoxian, followbtcnews, and netuoso. The goal is to help Steemit grow by supporting Minnows. Please find us at the Peace, Abundance, and Liberty Network (PALnet) Discord Channel. It's a completely public and open space to all members of the Steemit community who voluntarily choose to be there.